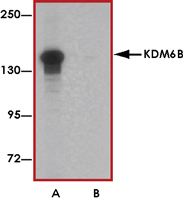 Sample Data :Western blot analysis of KDM6B in K562 cell lysate with KDM6B antibody at 0.5 ug/mL in (A) the absence and (B) the presence of blocking peptide. 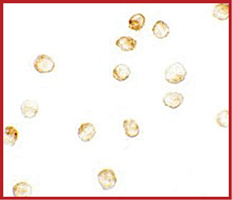 Sample Data :Immunocytochemistry of KDM6B in K562 cells with KDM6B antibody at 2.5 ug/mL. 2. Agger K et al: UTX and JMJD3 are histone H3K27 demethylases involved in HOX gene regulation and development. Nature 2007; 449:731-4. 4. Sola S et al: p53 interaction with JMJD3 results in its nuclear distribution during mouse neural stem cell differentiation. PLoS One 2011; 6:e18421.